Colorado Springs has been pummeled this year with extra snow and harsh winter weather. Normally at this time of year, Colorado Springs would have seen an average of 23.6 inches of snow. As of the end of February, however, Colorado Springs had already seen 38.2 inches of snow – and increase of 50% from the yearly average. In fact, Colorado Springs is ahead of the 30-year average for snow too! Weather analysts put part of the blame for the wintery weather on El Niño. This weather pattern pulls moisture from the West Coast and over the Rocky Mountains, resulting in snow, ice, and wintery weather mixes. Why? Hard as this may be to believe, the oceans are actually warmer than usual right now, even though we are not. This means that more moisture is being evaporated off the Pacific Coast and into the mountains. The result: snow, snow…and more snow. Unfortunately, weather experts and meteorologists say that the winter weather is far from over. More snow is on the way in the next couple of weeks. This means that Colorado Springs residents should be extra cautious when driving – especially during snow and icy weather. Remember: if you don’t have to be out and about, please don’t drive during bad weather. Sadly, winter weather conditions often cause tragic and fatal accidents, especially on twisting and turning mountain roads. 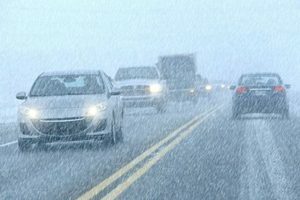 Semi-trucks drivers, motorcyclists, and motor vehicle drivers are all at an increased risk for being injured in an accident – especially when it is snowing or sleeting. Ice covered roads can be difficult to navigate and even the very best tires can lose traction when the roads are particularly slick. If you or someone you love is injured in a car accident this winter, it is important to know that you are not alone. An experienced Colorado Springs car accident attorney can help you through the difficult time following an accident. Your attorney can negotiate with insurance companies on your behalf and ensure that you receive the money you need to pay medical expenses, lost wages, and future rehabilitation. Without a lawyer on your side, insurance companies will usually offer the lowest possible settlement package – often far below what you actually need to cover your injury expenses and pay for the damage to your vehicle. Contact the experienced Colorado Springs car accident attorneys at the Green Law Firm today to schedule a no-obligation consultation and discuss your case. Call us today at 1-719-694-8515. We can help you after a traumatic car accident! Call today!